Finally, after a of July made of rain showers and gray skies, Summer has come to Rome! This means that we can stuff ourselves with ice cream, the best, sweet and fresh thing there is. But what is ice cream? Ice cream is a culinary method that allows you to carry a liquid mixture to a solid state, through the combined action of freezing and motion for it to incorporate air into the mixture and becomes creamy. In ancient times, at the time of Neanderhal Man, was already customary to eat frozen fruit, but it was not real ice cream, but rather of various kinds of fruits, milk, honey, but also meat and dried fruits that were stored in the ice to keep them. Another ancestor of ice cream it’s the sorbet, this is very different from his contemporary namesake, this was in fact an infusion made from sugar, water, herbs and spices that were frozen by an endothermic process caused by the addition of salts in the ice. Although we generally think that the ice cream came from Italy, France was to propagate the fame all over Europe. 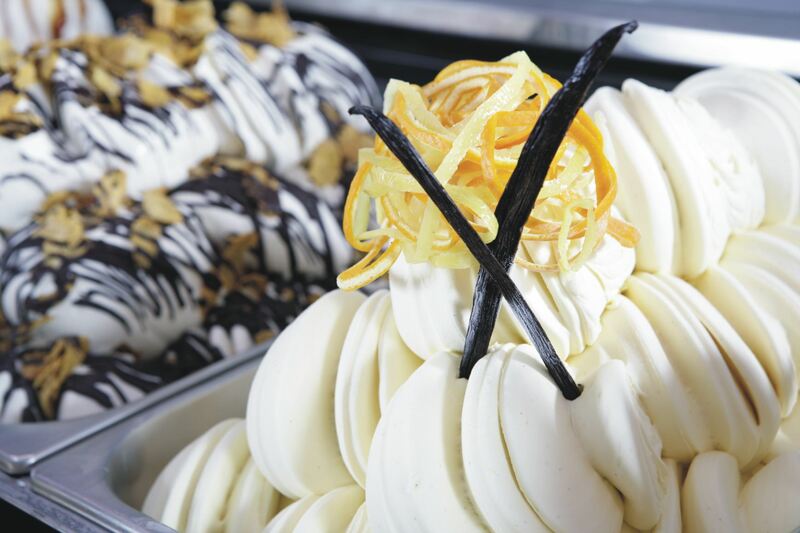 The sources tell of a Sicilian chef named Francesco Procopio dei Coltelli, who in 1600 perfected the method of his grandfather Francis, who dedicated his life to the study of a machine to make ice cream. Then moved to Paris, he tried his hand in countless experiments, and after replacing sugar with honey and have added salt to ice to make it last longer; was greeted by the people of Paris as a genius. One of his famous Parisian cafés, also became popular for being a great literary cafes, as was often frequented by people such as Voltaire, George Sand, Balzac, Victor Hugo, Diderot, D’Alembert, De Musset, Dr. Guillotin who gave the guillotine in France. Finalmente, dopo un Luglio fatto di acquazzoni e cielo grigio, l’estate è arrivata anche a Roma! Questo vuol dire che possiamo nuovamente abbuffarci di gelato, la cosa più buona, dolce e fresca che ci sia. Il gelato è un procedimento culinario che permette di portare una miscela liquida ad uno stato solido, tramite un’azione combinata di congelamento e movimento affinchè si incorpori aria nel composto e divenga cremoso. Nell’antichità, all’epoca dell’Uomo di Neanderhal, era già usanza mangiare frutta congelata, non si trattava però di vero gelato, ma piuttosto di frutta di vario genere, latte, miele, ma anche carne e frutti secchi che venivano conservati nel ghiaccio per mantenerli. Altro antenato del gelato è il Sorbetto, anche questo molto diverso dal suo omonimo contemporaneo, questo era infatti un infuso a base di zucchero, acqua, erbe e spezie che veniva congelato tramite un procedimento endotermico provocato dall’aggiunta di sali nel ghiaccio. Sebbene globalmente si faccia risalire il gelato all’Italia, fu la Francia a propagarne la fama per tutta l’Europa. Le fonti raccontano di un cuoco siciliano di nome Francesco Procopio dei Coltelli, che nel 1600 perfezionò il metodo di suo nonno Francesco che aveva dedicato la vita allo studio di una macchina per fare il gelato. Trasferitosi poi a Parigi, egli si cimentò in innumerevoli esperimenti, e dopo aver sostituito lo zucchero al miele ed aver aggiunto il sale al ghiaccio, per farlo durare di più; venne accolto dalla popolazione parigina come genio. Uno dei suoi famosi caffè parigini, divenne inoltre famoso per essere un grande caffè letterario, in quanto era spesso frequentato da gente come: Voltaire, George Sand, Balzac,Victor Hugo, Diderot, D’Alembert, De Musset, il Dottor Guillotin che diede la ghigliottina alla Francia. This entry was posted in Uncategorized and tagged Estate, Francesco Procopio dei Coltelli, Fruit, fruta, gelato, honey, Ice, ice cream, miele, Parigi, Paris, procope, procopio, sole, sugar, Summer, Sun, zucchero on August 5, 2014 by littlecloudydreams. The fashion wears clothes far more than the man’s face. La moda logora i vestiti molto più di quanto faccia l’uomo. This entry was posted in Uncategorized and tagged (William Shakespeare, Blink of Words, Citazione, Class, Classe, Dress, Dresses, Fashion, Fashion Week, Haute Couture, Moda, Mode, Parigi, Paris, parole, Quote, Shakespeare, Stile, Style, Vestiti, words on July 11, 2014 by littlecloudydreams. This entry was posted in Uncategorized and tagged 2014, Abiti, Atelier, Autunno Inverno, Bianco, Black, blu, blue, Cappotti, catwalk, clothes, Coat, Colori, colors, Completi, Designer, Dress, Dresses, Dressmaker, Fall 2014, Fashion, Fashion Designer, Fashion Runway, Fashion Week, Fiocchi, Fiori, Flakes, Flowers, Gown, Guests, Haute Couture, inspiration, ispirazione, Lilac, Lilla, Make-up, Moda, Mode, Modelle, Models, Nero, Ospiti, Parigi, Paris, Passerella, purple, Ralph & Russo, Ralph & Russo Couture, Runway, Sarte, Scarpe, seamstress, Seta, Sfilata, Shoes, Silk, Stilisti, Stoffe, Suit, Trench, Vestiti, viola, White on July 10, 2014 by littlecloudydreams. This entry was posted in Uncategorized and tagged 2014, Abiti, Atelier, Autunno Inverno, Bianco, Black, blu, blue, Cappotti, catwalk, clothes, Coat, Colori, colors, Completi, Designer, Dress, Dresses, Dressmaker, Fall 2014, Fashion, Fashion Designer, Fashion Runway, Fashion Week, Fiocchi, Flakes, Gown, Guests, Haute Couture, inspiration, ispirazione, Make-up, Moda, Mode, Modelle, Models, Nero, Ospiti, Parigi, Paris, Passerella, Runway, Sarte, Scarpe, seamstress, Serkan Cura, Seta, Sfilata, Shoes, Silk, Stilisti, Stoffe, Suit, Trench, Vestiti, White on July 10, 2014 by littlecloudydreams.